The Medway Megaliths & the Phantoms of Blue Bell Hill | Unofficial Britain. The area is the most densely populated part of the UK and much of the magic has been leached away, covered in tarmac or simply forgotten. Choked with exhaust fumes amid the rumbling of several lanes of traffic, it takes a degree of mental effort to imagine the area as anything other than a place to drive through. 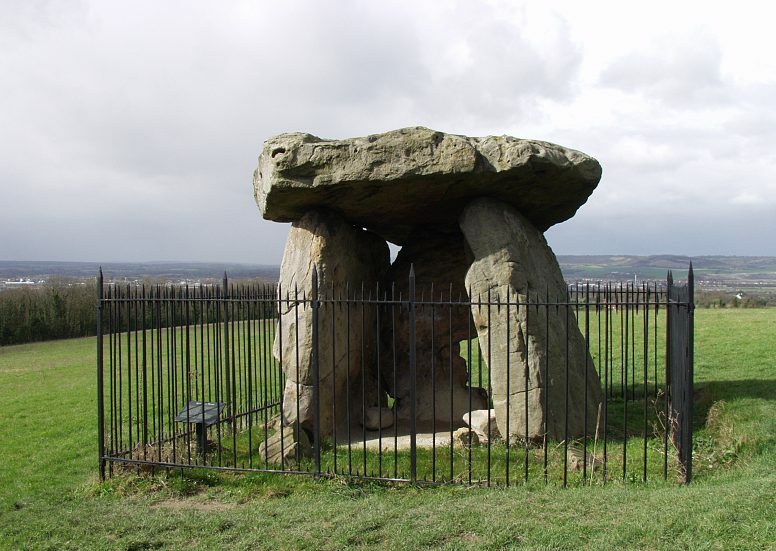 The Medway Megaliths are a potent example of this; thousands of years old, located in the lower valley of the River Medway in Kent, sitting on Blue Bell Hill with striking views across the North Downs, but almost unknown even to those who live near them. This is a polluted, traffic clogged part of the county of Kent where the A229 dual carriageway connects the M2 and the M20. HS1 burrows into the hill through the North Downs Tunnel. It’s a far cry from the lush landscapes of Wiltshire and its camera-friendly ancient sites; more JG Ballard than Arthur Machen. The stones and barrows of Kent are the only known prehistoric megalithic group in eastern England and the most south-easterly group in the whole country; almost an anomaly. The stones are relative unknowns; I’d never heard of them until recently, despite growing up in Kent and being interested in ‘all that boring landscape stuff’ (my girlfriend’s phrase). I’d been reading something about Julian Cope and his fascination/obsession with the megalithic period and stumbled across the name of the Kentish sites; west of the river Medway sit the Coldrum stones, Addington long barrow and Chestnuts long barrow. East of the river, Kit’s Coty, Little Kit’s Coty House and Smythe’s Megalith. These are the tombs of the long dead, remnants from a world opaque and mysterious. Kit’s Coty sits alone looking over the downs, unloved and barely signposted, the constant drone of traffic ever present but blocked from view by shreds of woodland. Visit Kit’s Coty and you’re more than likely to be the only visitor. Look closely, and you see inscriptions from Victorian times etched into the rock. Before the National Trust fencing went up. The dead telling you we were here. Blue Bell Hill is a forgotten necropolis, a dual-carriageway of the dead. It holds a much greater degree of fame for its variation on the phantom hitchhiker myth that manifests itself all over the world. The roads above the Neolithic tombs are littered with stories concerning spectral young women; young girls going under the wheels of cars only to disappear, polite hitchhikers who vanish from back seats. This is a modern myth, something born from the motorway and tarmac, the stories only dating back to the 1960s. November 1965, so the story goes, a Ford Cortina was in collision with a Jaguar on Blue Bell Hill. 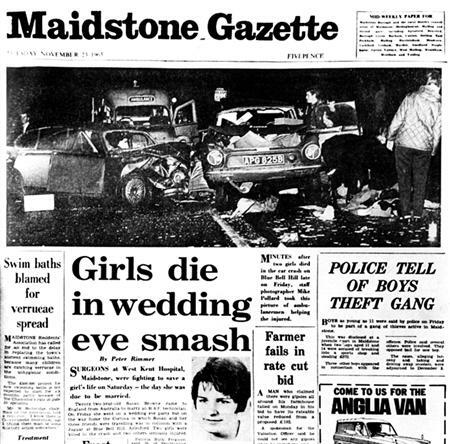 The Cortina was occupied by four women; a 22-year-old woman due to marry in Gillingham the following day and her three hen-party companions. The bride-to-be died five days after the collision at West Kent Hospital, one of her companions was killed in the accident and a second died on admission to hospital. The fourth was seriously injured. Both the Jaguar’s occupants survived. One of the three dead women is held to be the phantom hitchhiker. Either the bride-to-be or, more often, one of her friends. Incidents on the hill crop up periodically with coverage reaching into the mainstream media. Local filmmakers have taken it upon themselves to dramatise the story of the Bluebell ghost, complete with dodgy 60s dancing and estuary English. 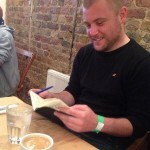 Type ‘blue bell hill ghost’ into Google and you’re hit with a flurry of articles from the seemingly endless haunting/paranormal websites that go into great, sometimes confused, detail about the various sightings, and theories as to what’s going on. In my researches and visits to the area, I uncovered yet another piece of tragic history associated with the place, this one with a strange personal link. In 1998 an air ambulance crashed near Burham whilst returning to Rochester Airport, having collided with power cables. All three crew – the pilot, Graham Budden, and two paramedics, Tony Richardson and Mark Darby – were killed on impact. 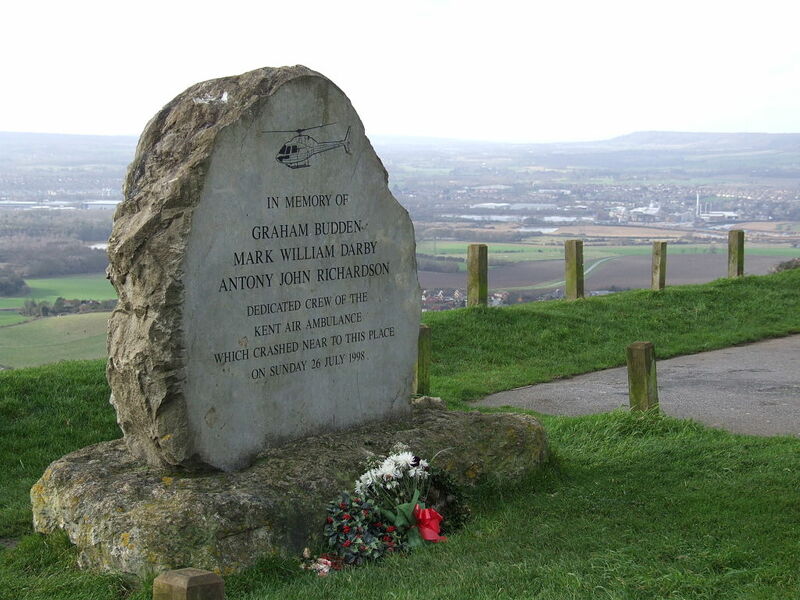 A memorial to the crew sits near the site of the crash, at the Blue Bell Hill picnic site. The same year, the ‘beast of Blue Bell Hill’ was photographed – though apparently on the wrong side of the river. Blue Bell Hill compels people to believe in something other than petrol and tarmac and the A229. The dead of the Neolithic sleep nearby. Victorian graffiti was etched in stone before the road appeared. The melancholy story of the young woman persists. Graham Budden is memorialised on the hill while big cats prowl. I don’t really believe in ghosts; the persistence of human imagination in these unlikely places is what is of most importance. The haunted dual-carriageway in spitting distance of ancient tombs? It’s a story that writes itself. Julian Cope’s The Modern Antiquarian is a seriously researched, ‘must read’ compendium of megaliths, stone circles and other monuments of ancient Britain.